Sometimes there are things in the beauty world that haunts us forever. 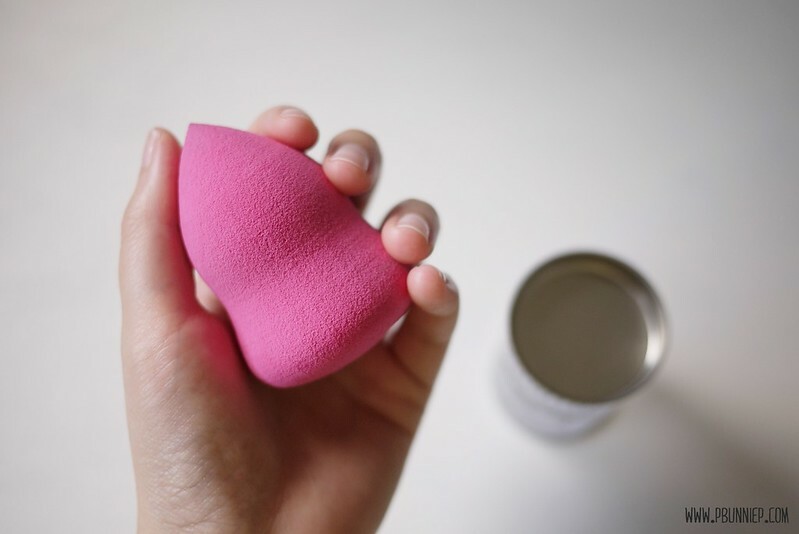 Take the Beauty Blender for example, it's one of the beauty tools to really revolutionalize the way people looked at foundation, causing a new wave of excitement that hasn't been seen probably since the invention of latex sponges. While I'm a big fan of beauty gadgets, this one went a little high over my head and so I decided to experiment with something a little lower budget first. 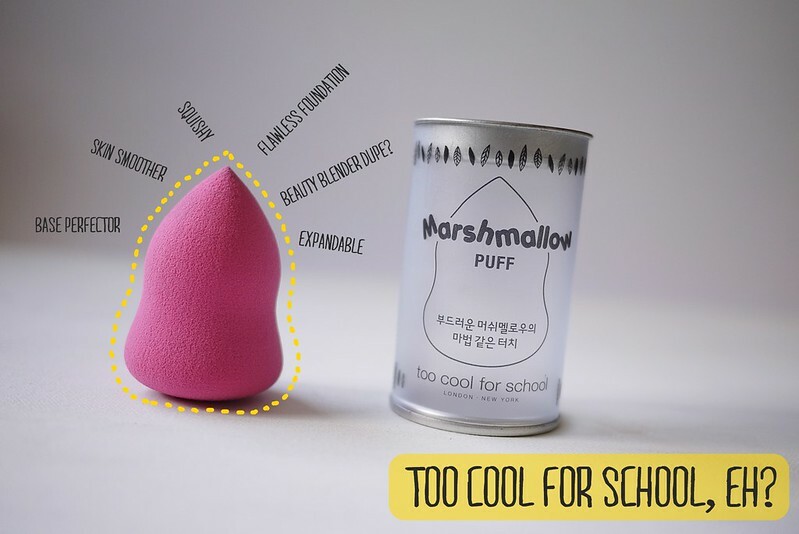 Say hello to the Marshmallow Puff from the cheeky Korean makeup brand Too Cool for School. Would I repurchase: Not with a 10ft pole. Let's get straight to the point, there has been many Beauty Blender-esque products released on the market and until I try the real deal, they all seem very similar to me both in concept and function so I'm assuming I'm not missing much by starting off with a cheaper puff. This little tool came in a well packaged plastic container with a pop off lid. Instead of the usual round tear drop shape, we have a gourd-like curved design which I find makes it easier to grip in the center. Aesthetically in intriguing? Check that! Following the instructions of most blender puff tools, I wet this under some water to see how much it changed. When dry the foam was quite dense and had a decent firmness to it, it also stood at around 6cm like you see it on the left side of my photo. After a few moments in water, the body swelled up dramatically, gaining a more squeezable texture and expanding to around 7cm in height. 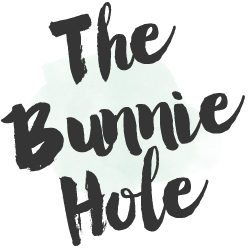 I played with this in several ways over the weeks and while it may look straightforward, I found that not all products worked the same way with this little puff. 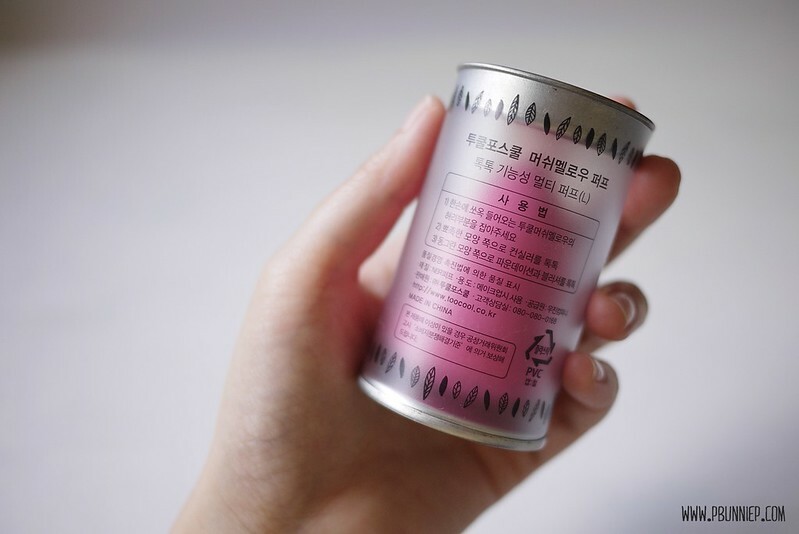 Very fluid products were absorbed too quickly and I could hardly get anything to blend onto my skin. Slightly creamier foundations with higher viscosity or even cream foundations were much better partners, sitting near the surface of the sponge and transferred smoothly during application . Compared to using more traditional sponge wedges, I found this to give slightly better adhesion and was able to spread the product in thin even layers, allowing customized coverage over different areas of the face depending on how many layers you add. But this is about where the fun ends. The "bouncing" motion that is recommended did not feel nice on my face and I felt like I had to press rather hard in order to get my base to apply evenly, even though it was soft to squeeze in my hands it wasn't so soft on my skin. After a few seconds of bouncing, I was no longer amused and found it a bit of a drag as it actually took longer to apply my base this way than with my favourite foundation brush. Unfortunately washing this puff was also difficult as the thickness made it hard to thoroughly remove all the foundation build up. There was no easy way to swirl or scrub so the only thing left to do was to squeeze it until the water ran clear and by that time my fingers were not happy at all. To add to this conundrum, I had nicked the rounded bottom during washing and caused a small tear in the puff. I think I am just so done with this puff. Normally, I'd have some redeeming things to say about a product as we all have different tastes and needs. However, I am at loss for words because with the exception of this making foundation apply with better adhesion, it is just too much work for no miracles. I have a feeling that the real beauty blender may be a tad softer and possibly cover more surface area per "bounce" but as a whole I don't think I'm missing out on my much at all. Do you own the Beauty Blender or have tried similar puffs? 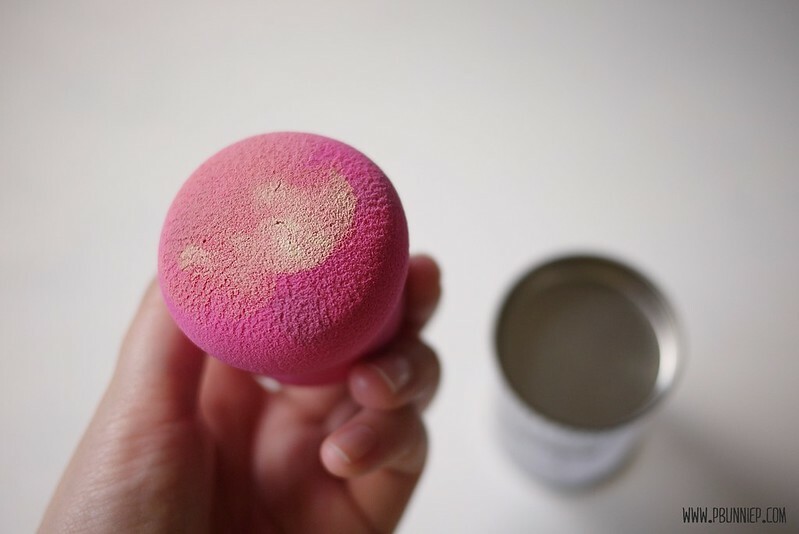 I've never been too keen on these types of foundation sponges. I prefer to apply my base with a brush (Sephora Professional #55) or my fingers and that's that. The hassle of having to wet this thing, bounce it all around, wash it, and set it out to dry every day just doesn't appeal to me. Besides, I feel like a moist sponge sitting around is a straight-up breeding ground for bacteria and mold. No thanks. I've actually become quite the sponge collector! So far, I have four Beauty Blender type sponges but they definitely vary in quality. 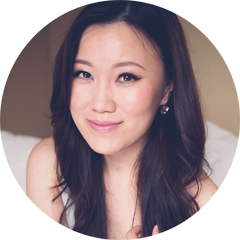 I have been using them nonstop in the summer, preferring light coverage instead of the better coverage that my Shiseido Perfect Foundation brush gives. I use clean fingers to apply foundation but the sponge to finish blending by bouncing, much less foundation waste that way. I did have a hard time cleaning them when I first started but quickly learned to use cleansing oil to break down the foundation and to use bar soap or pure liquid soap instead of liquid soaps with a water content. Actually with the heat here, they dry much faster than any of my foundation brushes, so I would be more concerned with bacteria in those dense synthetic brushes. Oh for some reason I'm so not interested in these sponges. I've seen a few, including the BB but I don't get what more than can do. I'm pretty good at blending and the "bounce" kind of turns me off.